115,000 cocoa farmers trained, 2,550 farmer field schools set-up and 77,000 farmers certified since the Cargill Cocoa Promise launched in 2012. Distributed 25 million seedlings to promote farm development. Improved access to education for over 34,000 children and health care for over 25,000. 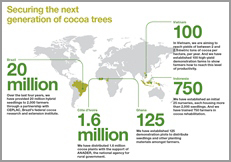 Read the 2014 global Cargill Cocoa Promise report. 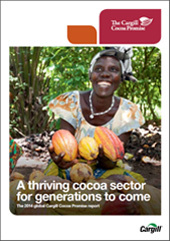 Amsterdam, The Netherlands – 5 June 2014 – Cargill has released its first global progress report on its activities to support cocoa farmers, communities and the development of a sustainable global cocoa supply chain. The report entitled “A thriving cocoa sector for generations to come” highlights the progress the company has made since its work began over a decade ago and the Cargill Cocoa Promise was launched in 2012 to align its efforts. The Cargill Cocoa Promise has reinforced the company’s global commitment to improving the livelihoods of farmers, their families and their communities, and to securing a long-term, sustainable supply of cocoa. The global programme is taking a local approach by using Cargill’s extensive on-the-ground sourcing network to strengthen farmer organisations and work with communities, governments and NGOs to understand local issues and make tangible, long-term differences. The three pillars of the Cargill Cocoa Promise. Certification programs in the 2012/2013 crop year. Cargill Cocoa Promise's global presence. Securing the next generation of cocoa trees. The Cocoa Promise is addressing key challenges in the sector including the need to increase yields and incomes for farmers; improve access to training, infrastructure and finance; improve access to education and healthcare in communities; and regenerate farmland. Over 115,000 farmers trained in good agricultural practices in Côte d'Ivoire, Ghana, Cameroon, Indonesia, Brazil and Vietnam. 2,550 Farmer Field Schools established globally to provide training and knowledge sharing locally. 77,000 farmers and over 342,201 hectares certified through farmer cooperatives and organisations. Establishing the Coop Academy in Côte d'Ivoire – a unique, industry-first programme to provide cooperative leaders with knowledge and skills to grow their businesses more successfully. U.S. $25 million of certification premiums paid to farmer cooperatives – 50 percent directly benefits farmers while remainder invested by farmer organisations in local communities. 25.3 million seedlings distributed to support growth in cocoa production, particularly in Brazil. Improved access to education for over 34,000 children in cocoa communities through school build activities, training teachers and providing books.